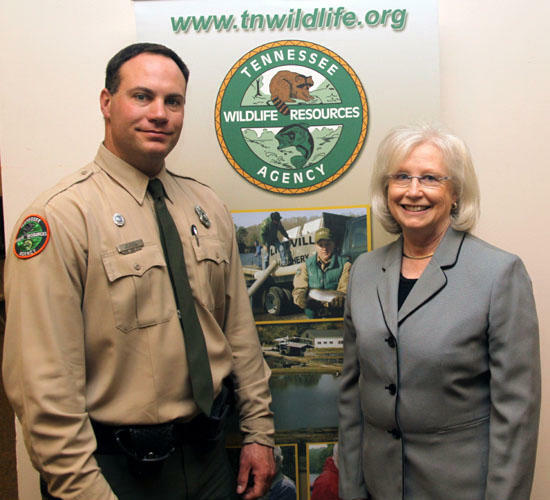 Sen. Mae Beavers is pictured with Tennessee Wildlife Resources Agency Wildlife Officer Ed Gover after purchasing her 2010-11 Tennessee hunting and fishing license. NASHVILLE — Sen. Mae Beavers purchased a 2010-11 hunting and fishing license from the Tennessee Wildlife Resources Agency at Legislative Plaza to show her support for the agency. Agency staff members were present at the Plaza recently to sell the new licenses. Sen. Beavers represents District 17 which is comprised of Cannon, Clay, DeKalb, Macon, Smith, Sumner, Trousdale, and Wilson counties. “I support hunting and fishing in Tennessee and supported the constitutional right to hunt and fish,” Sen. Beavers said. License sales provide the primary funding for the TWRA, which does not receive any funding from the state's general fund (i.e. state sales tax). The TWRA relies on license sales as its primary source for funding for its management programs. Licenses are available at any Tennessee Wildlife Resources Agency (TWRA) regional office, licensing agent, and on the TWRA Web site, www.tnwildlife.org. The licenses are valid through February 2011.